In January, MOMS man in Bulgaria, Atanas Kovachev, brought us news that plans had been confirmed for a charity match between Aston Villa former players and a Bulgarian National Team XI on 25th of May in Sofia,Bulgaria at the “Ovcha Kupel (Slavia) National Stadium”. The news has now been officially announced by the Aston Villa Former Players Association. The Bulgarian team will include some of our greatest stars from the recent past – Hristo Stoichkov,Liuboslav Penev,Krasimir Balakov – and also will see a return in a Bulgarian national shirt for Dimitar Berbatov (who retired from international football). The team will even include the outgoing Prime Minister of Bulgaria – Boyko Borisov – who played for a local amateur team in the 4th tier of Bulgarian football. Coaching the Bulgarian XI will be probably the country’s greatest coach Dimitar Penev, who led the team during the USA World Cup in 1994. Stiliyan Petrov has overseen the arrangements for the game which will be in aid of children in Bulgaria who suffer from Leukaemia. 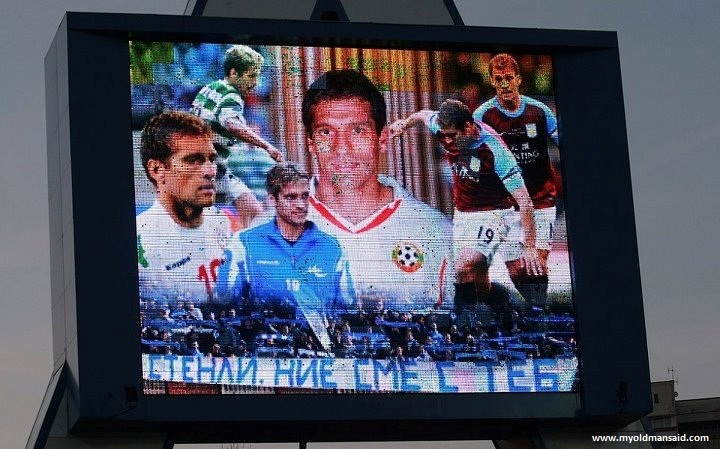 Petrov will also be in attendance in Sofia for the occasion. From what we’ve seen here on MOMS already of the stellar Bulgarian support of Petrov in his homeland, it should be a grand event, with no doubt a lot of new friends being made along the way. Examples of Petrov support across Bulgaria. ‘A private Bulgarian Air plane will take you from Birmingham to Sofia and you will spend the days with a host of stars, either watching the football or playing golf or both! 25 former Villa stars will be on the tour, fun and fundraising with “Stan” is the real game! There are a limited number of tickets so, for more information and the schedule, drop a line to [email protected] or go on to our website at www.astonvillafpa.org for more details. If you are a potential sponsor for this event then also drop Richard a line – there are packages from £1000-£20,000 and you can expect some really high-profile TV coverage, both in Bulgaria and the UK.